Obama: A New Force In Publishing Move over, Oprah. There's a new "O" causing a stir in the book world. As Barack Obama's reading list pushes book sales, publishers celebrate the election of a president who loves to read. A 2006 Skokie Public Library poster features the president-elect reading Team Of Rivals: the Political Genius Of Abraham Lincoln by Doris Kearns Goodwin. "It's great news for Democrats," he said. "It's great news for African-Americans. But I think it is also great news for everyone here tonight because our new president is, in the broadest sense of the word, a reader." It's not so much that reading has been absent in the White House in recent years — First Lady and one-time librarian Laura Bush is a voracious reader, and in a recent column in the Wall Street Journal, Karl Rove revealed that President Bush finished 40 books last year and 95 books in 2006. But Harold Augenbraum, the executive director of the National Book Foundation, says the book world sees something different in Obama because he's the author of two best-sellers: "You actually have both a writer and a reader in the White House who is articulate and eloquent in his own right." What's more, Obama is an orator, and Harper's vice president and publisher Jonathan Burnham says it's the president-elect's way with words that so excites the publishing world. "He's deeply interested in the effects of words on listeners and on readers, so that makes his reading more important," says Burnham. "And it's clear that he reads not just for entertainment, but to stimulate whatever gifts he has that make him the incredible speaker that he is." Obama likes nonfiction, and he likes novels by great American writers like Toni Morrison and E.L. Doctorow. And he can help sell books. When he's seen reading a book on a plane or carrying one in his hand during his travels, it can create a stir. When Obama was photographed holding Fred Kaplan's Lincoln: The Biography of a Writer, the book's sales bumped immediately, and requests for media interviews with the author surged. 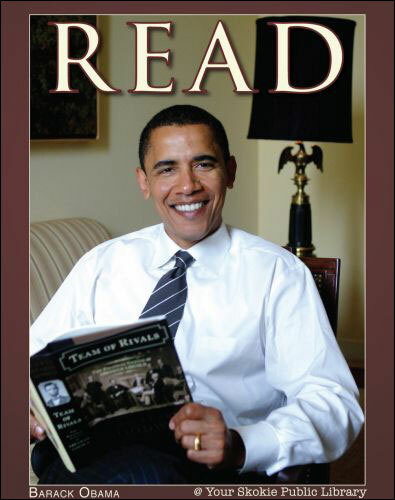 Another time, Obama mentioned that he was reading a new book about Franklin Delano Roosevelt, causing a stir at several different publishing houses — each of which offered titles on the former president. "It was a funny moment because there were three different publishers who all thought we had a book he was reading, and I thought that was pretty great," says Jeff Seroy, a publicist at Farrar, Straus and Giroux. As it turned out, the FDR book was published by a competitor, but Seroy says Obama has mentioned two FSG books: One was a book of selected poetry by Derek Walcott, the other was Hot Flat and Crowded, by Tom Friedman. "It's obviously thrilling to think a book you have published is going to have a hand in shaping the thinking of a chief executive, in shaping public policy, and thrilling to think that attention can be called to a book in such a timely and important way." Perhaps, Seroy likes to say — only half in jest — Obama will have the kind of influence on book sales that his supporter Oprah Winfrey has had. "I think there's room for two Oprahs, and I think if there is a new Oprah, Oprah will be happy that Obama is the new Oprah," he says.